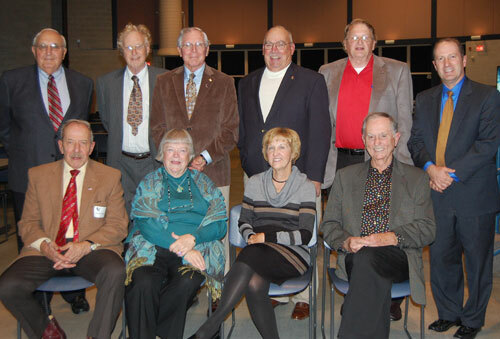 On Monday, December 3, 2012, the Penn Manor School Board hosted a leadership dinner. Past administrators and former board members were invited to Manor Middle School for dinner prior to the annual reorganization board meeting. Penn Manor’s first superintendent, Dr. Elmer Berkebile, who served the district from 1967 until 1983, was present as were past board members (pictured from left to right, front row) Richard Bauder, Alice Ahlfield, Jane Barley, and Donald Funk, (back row) Peter Alecxih, Ken Greider, Perry Love, Robert Kindig, Willis Herr and Pat Kline.